Consider! 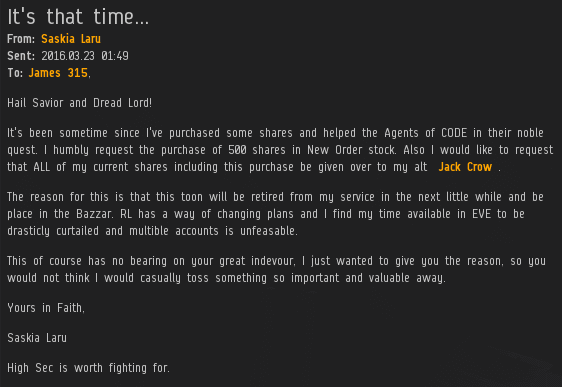 The New Order's Treasury and ship reimbursement program are truly unique in highsec. Only a small number of massive nullsec entities have built anything comparable. People often talk down highsec, and they never imagined that something so great could arise from there. So when you think about it, everyone in highsec should take pride in the New Order's accomplishments. Otherwise they're unpatriotic--and actually rather disloyal to highsec. Troy Cesaille went from non-compliant miner to proud owner of 200 shares. I didn't reply to this EVEmail; it's clear that Troy was able to realize the benefits on his own. Saskia Laru bought an additional 500 shares and transferred them, along with all the other shares she owned, to Jack Crow. The purchase sent us over the 1 trillion 12 billion isk mark. So who should get the Supreme Protector's Tip of the Hat™, Saskia or Jack? I've decided to give a Supreme Protector's Tip of the Hat™ to Saskia. It could be her final act of service to the New Order. Unless the person who buys the character from the Bazaar also supports the New Order!